A common bumper sticker, which I have always hated states: God Is My Co-Pilot! I’ll bet He appreciates being second in command. But today I listened to a CNN interview with B.J. Gallagher, author of If God Is Your Co-pilot—Switch Seats. I have not read her book, so I can’t recommend it just yet. But as soon as I do, I will give you my opinion. The concept, however, is the key point. God needs to be in control. He needs to be trusted to be the pilot, and we may not even be in the co-pilot seat most of the time. On January 15th, 2009, U.S. Airways flight 1549 flew into a flock of Canadian geese as they were taking off from LaGuardia Airport in New York City. The co-pilot, Jeffery Skiles was at the controls when they birds flew into the windshield and both engines. Passengers hearing the loud thumping on both sides of the aircraft were aghast as they watched momentary flaming exhaust pouring from both engines, followed by complete silence. They were without power at only 3000 feet. At that moment, Captain Chesley B. Sullenberger, a former fighter pilot with the United States Air Force, and acclaimed glider pilot issued a two-word command that defined everything. He said simply, “My airplane” as he placed his hands on the controls. First officer Skiles did not question or doubt his captain. In response he took his own hands from the controls and raised them, signifying that he had relinquished control of the plane to the man in charge. Ninety seconds later, Captain Sullenberger notified his crew to brace for impact as he set the unpowered Airbus 320-214, with 150 passengers on board, onto the icy waters of the Hudson River. Immediately, holes torn in the underbelly of the fuselage began to pour water into the rear of the cabin as three flight attendants scrambled to help passengers out of the plane onto the wings. With a wind chill of 20 degrees and water temp of 36 degrees, hypothermia was a concern, but they had no choice. 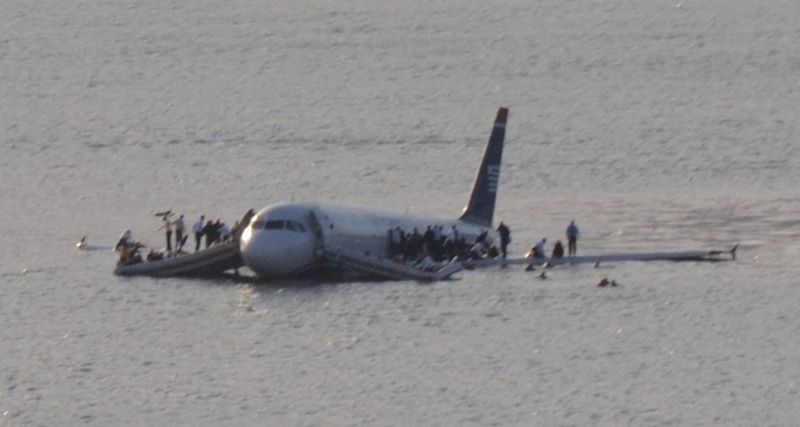 As the passengers were being helped into rescue boats that began arriving within four minutes of the crash, Captain Sullenberger was in the back of the plane, searching the freezing waters for anyone that may still be trapped. Before he agreed to exit the plane to safety, he insisted on checking one more time to be certain they weren’t leaving anyone behind, and would not leave until everyone else was rescued. In my own life, there have been many times that I have been in control—or so I thought, only to find myself suddenly in a crisis I never saw coming, heading for the ground with no hope of survival. The question is, when Jesus says to me, “My Airplane”, am I as smart as First Officer Skiles, or do I say, “No thanks–I got this”?